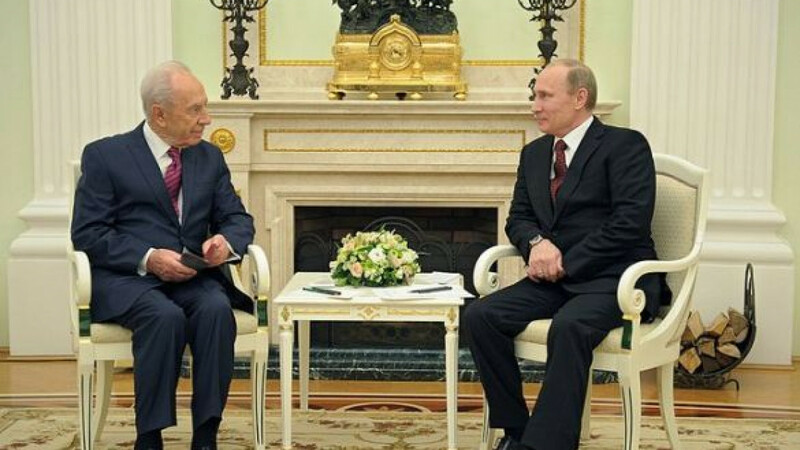 Putin meeting with Israel President Shimon Peres in the Kremlin in early November. Among members of the Middle East Quartet, Russia enjoys perhaps the warmest relationship with Hamas, the radical Islamist party that controls the Gaza Strip. Yet when Hamas and Israeli representatives sat down last week to halt a week of bloody clashes in and around Gaza, all Russia could do was watch from the sidelines as Egyptian and American mediators hammered out the deal. Russia has positioned itself as a potential mediator in the Israeli-Palestinian conflict, but an analysis of its interests and influence, as well as changes in the region's political landscape, should prompt a rethink of that stance, experts said. Alexei Malashenko, an analyst with the Moscow Carnegie Center, said Russia should put its natural links to Israel ahead of its desire to be seen as an international power player. "Russia wants to be a mediator, but it leads to nothing," he said. "What is the reason for becoming a mediator? To show America and Europe that Russia is able to perform a so-called 'independent,' special role in the Middle East," he said by telephone on Friday. Russia should instead concentrate on building ties with Israel, already a strong partner on military technology, counterterrorism and energy, rather than with Hamas, which he said has little to offer Russia, except perhaps as a thorn in the side of the West. Russia's ties to Israel are cultural as well as economic. About 1 million Israelis, or 1 in 7, are Russian-speaking immigrants from the former Soviet Union. One prominent example is Foreign Minister Avigdor Lieberman, who was born in Soviet-era Moldova. Shared culture and language, as well as the bilateral abolition of visas in 2008, have helped to encourage Russians to visit Israel in record numbers. About 314,000 Russian tourists visited Israel in the first six months of 2012, a 20 percent rise year on year, although the most recent flare-up in violence has reduced the flow of visitors. Perhaps tellingly, Israel's tourism minister, Stas Misezhnikov, is a native Muscovite. Russia and Israel have exchanged historic official visits in the last few months. In June, President Vladimir Putin visited Israel and the West Bank for the first time in seven years, accompanied by four planes carrying 300 businessmen and officials. Earlier this month, Israeli President Shimon Peres visited Moscow, where he stopped by a new Jewish museum that organizers dubbed the world's largest. Russia's simultaneously friendly relationship with Hamas has at times enraged Israel and members of the Middle East Quartet, the club charged with shepherding stagnant Israeli-Palestinian peace talks that includes the UN, the United States, the EU and Russia. Russia was the first major power to hold direct talks with Hamas, which took place in Moscow shortly after the group won Gaza elections in 2006, the year before it seized control of the territory. One Israeli minister said the meeting amounted to "stabbing Israel in the back," the BBC reported at the time, although Russia insisted that it simply favored dialogue over silence and recriminations. While Russia has publicly encouraged Hamas to recognize Israel and renounce violence, it has not designated Hamas a terrorist organization as the United States, the EU and Israel have. Russia on Thursday reiterated its support for the Palestinians' bid to be recognized as an independent state, a move both Israel and the United States oppose. In yet another move certain to win Palestinian sympathy, Russia has agreed to help an international investigation determine whether former Palestinian leader Yasser Arafat's death in 2004 was caused by poisoning. In July, a Swiss institute announced that it had discovered high levels of polonium-210, a rare radioactive substance, on Arafat's clothing. Incidentally, polonium-210 is the same substance that allegedly killed former Russian spy and Putin critic Alexander Litvinenko in London in 2006. Theodore Karasik, a senior analyst at the Institute for Near East & Gulf Military Analysis, or INEGMA, said courting both Israel and Hamas had been an "astute diplomatic approach." "The old state system established after World War I is over. Now we are entering a new era in which observant Islam is the driver," Karasik wrote in an e-mail Friday, referring to the Arab Spring revolts and the ongoing war in Syria. Fyodor Lukyanov, editor-in-chief of Russia in Global Affairs, said these political upheavals should prompt Russia to refocus its energy. The situation in the Middle East has fundamentally changed, including what he said was essentially the collapse of Mahmoud Abbas's Palestinian Authority, which controls the West Bank, and the Quartet, neither of which played a major role in last week's ceasefire. "Russia can't accomplish anything in Palestine and would be better off distancing itself from the process," Lukyanov said by telephone on Friday. "Russia has enough on its hands in Syria." Foreign Minister Sergei Lavrov last week called the Quartet an "insufficient" format for resolving the Israeli-Palestinian conflict and urged the group to work with the Arab League. Asked what Russia had done to resolve the latest crisis — aside from propose a UN Security Council statement that was quickly swatted down by the United States — a Foreign Ministry spokesman on Thursday cited "active efforts" involving all sides. Five Israelis and more than 150 Palestinians died in the fighting, which began on Nov. 14 with Israel's targeted assassination of Ahmed al-Jabari, Hamas' military chief, in Gaza City.